Hi friends. Hope you're keeping warm if you are in the midst of winter where you are. We are cold again, wind chill 10 below today. Good day to stay in and create. from this set on my card. 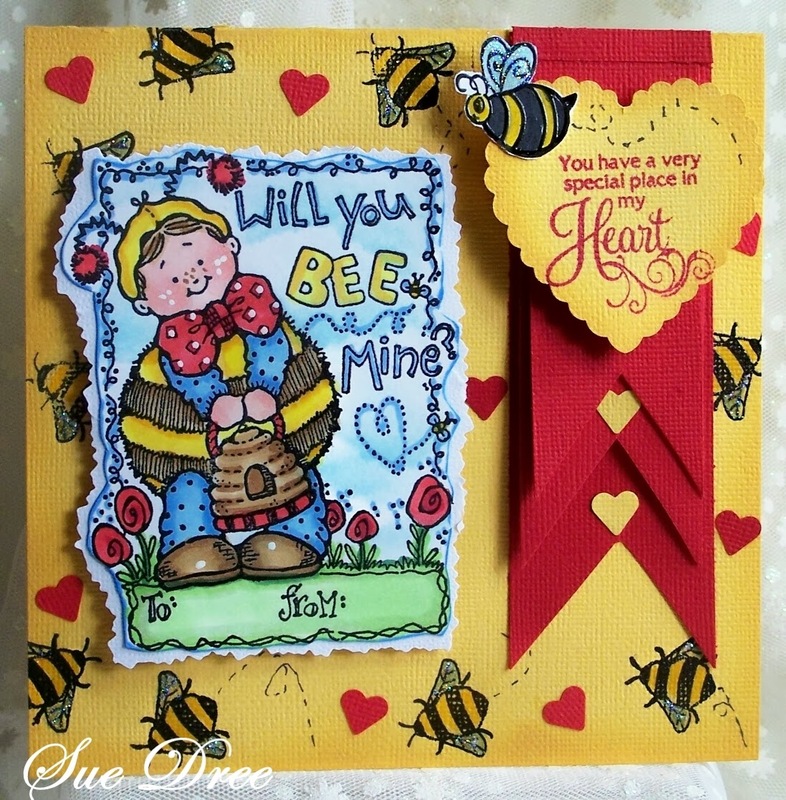 Also, Penny Black and More January Challenge, Love is in the Air. I paired it with this vintage (1998) stamp from Penny Black that I just love. Banner created with bright red textured cardstock. once a month, my poor PB stamps are feeling neglected. Absolutely gorgeous hun and i so wish i had this super stamp too, the oldies are favourite too. It would be lovely, if you entered the Penny Black & More Challenge 'Love And Marriage', this month too. gorgeous card! very cute is that boy. looking like a bee....the text matches very good. yes...I heard it on the news that new york is going very cold again. I hope that give no problems. 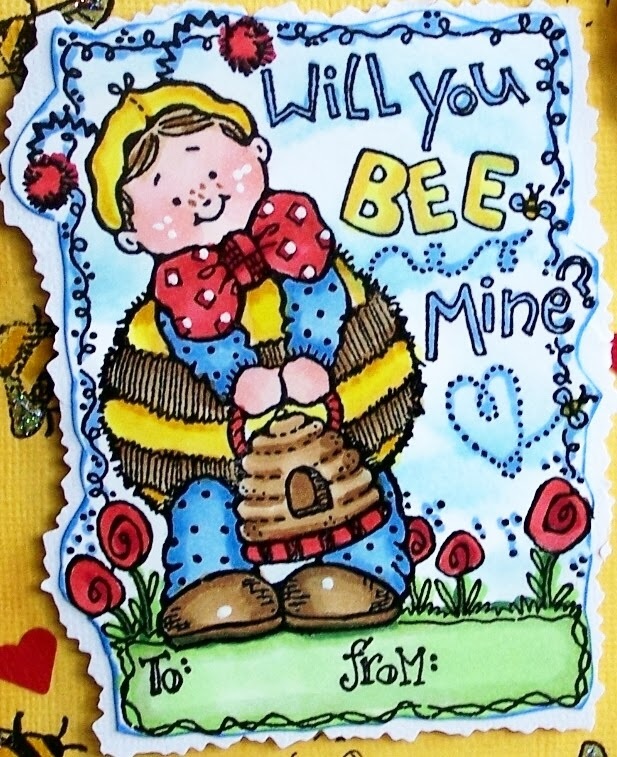 Hello Sue, I just love your card,it is so sweet, wonderful colours and sentiment. Wonderful details. How cute, Sue. It does remind me of the cards we used to exchange in grammar school. Just adorable. Love the layered banners and such a cute sentiment. Very cold here also and should stay that way for the next few days. Maybe more snow on Saturday. Stay warm. Such a delightful card Sue. I love the cheery image, gorgeous colours and beautiful sentiment. A fabulous layout too. That is such a great old stamp, Sue. I have been digging in the closet, and trying to find some oldies but goodies, myself. Love all the little details. Colors in this are awesome. I love the combination of flags and the digi. Going to be a favorite for the recipient too. I like the country feel to it. A very pretty card Sue and really like the banner effect down the side. wow-this is a great card, love the layout and the banner is fab. Such a sweet card - love the colours! Super image and love the yellow bee background you made! Adorable and delightful, love it!